Harris Dental Celebrates Grand Opening!! Last week, in celebration of our Grand Opening in Scottsdale and Chandler, we teamed up with several local Charities and offered free dental care for the day to their beneficiaries. We had an entire team at both locations offering services. We donated over $10,000 in free dental care. 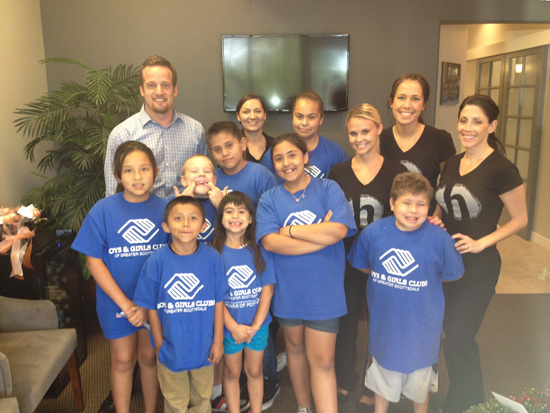 We teamed up with The Boys & Girls Club of Scottsdale, ICAN in Chandler, Chandler Gilbert ARC, A New Leaf in Chandler and Save The Family Charity. It was an awesome day and we felt very blessed to give back to the communities! Dr. Harris and staff with the Boys & Girls Club. Dr. Harris performing dental exam and cleaning.